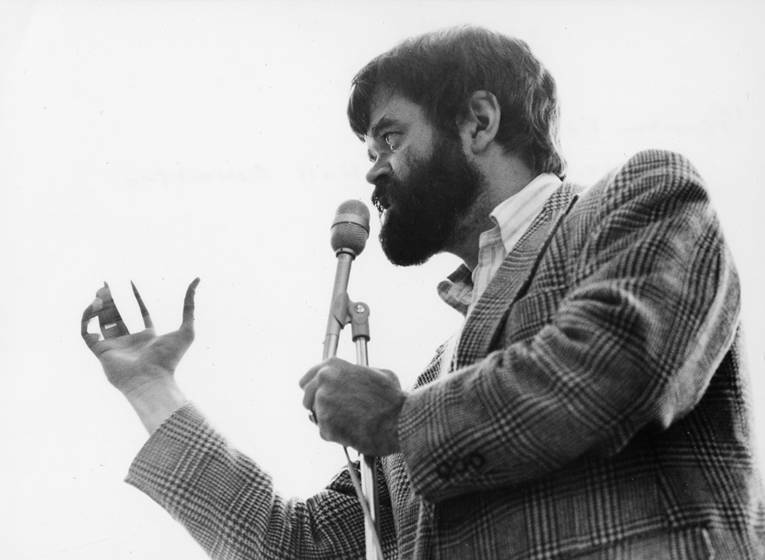 Garrison Keillor, 1979. University of Wisconsin River Falls Archives. While going through the Robert Bly Papers at the University of Minnesota, I came across two letters I wanted to share. In the past I’ve posted pieces from young writers like Oscar Wilde, Aldous Huxley, and Hunter S. Thompson, but the following come from two of the state’s most-famous contemporaries. The first excerpt is from Garrison Keillor (age 27) and the other from Bill Holm (age 26). Dated April 9, 1969, on UMN Department of Radio and Television letterhead, Keillor complimented Bly on a recent reading, noting the recording was to be aired on the college radio station. He went on to add that they had a mutual friend, prompting a curious anecdote about his travel habits. Cleverly, Keillor ties this to his appreciation of Bly’s work. … I was in New York looking for a job. … Whenever I sleep in somebody else’s house, I wake up at five in the morning. I woke up early at Roland’s and sat in his garden for a couple hours, having to piss desperately and afraid if I did I’d wake up the babies with a flood. It slowly dawned on me that nobody would hire me because I don’t want to work, and I put together laboriously some pieces of that morning into a poem which I’ve been afraid to read anyplace lest somebody accuse me of imitating you. I mention this by way of saying a few poets can re-order our consciousness so that from time to time we live inside their poems, and that you are one of them. Anyway, thank you for the generous compliment at the reading. 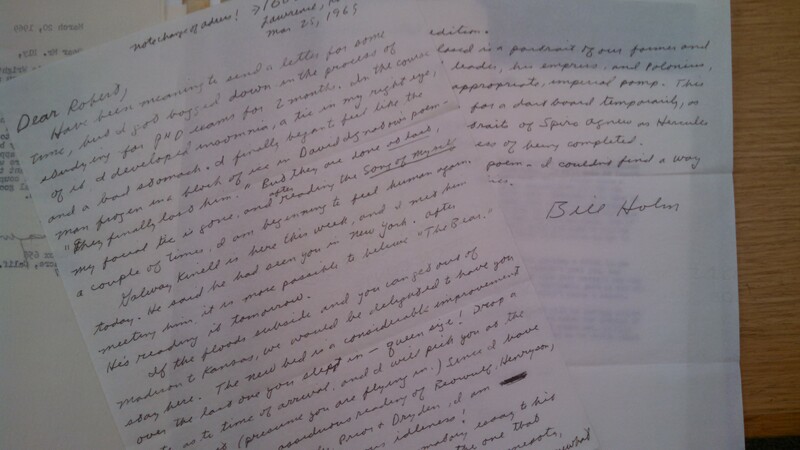 Letter from Bill Holm to Robert Bly, c. 1969. Around that same time (March 25, 1969), Bly also received a letter from Holm who was then working on his PhD at the University of Kansas. Their relationship is more intimate with both growing up in western Minnesota. As Holm writes, school was stressful, but it was nothing Whitman couldn’t help. As a treat, he included a poem called “Dog,” which as far as I know has never been published. I’ll leave its literary merit to your judgment. What I enjoy about these excerpts is their insight into the relationships Bly maintained with young writers. Though under no obligation to be responsive to anyone, his papers are filled with hundreds of letters from well-wishers, many of which end the same way: “Thank you.” Never teaching at an institution, his engagement with students was limited to readings and letters, in which he was always encouraging and supportive. I know this firsthand through my own (limited) correspondence with him. If the generations of writers he’s inspired shows anything: such responsiveness means something, it works. Source: Robert Bly Correspondence series (Mss 81s01), Literary Manuscripts Collection, University of Minnesota Libraries, Minneapolis. Box 14, Folder 1. Great share, after reading these letters I’m slightly less disillusioned in my own path of creating poetry so I thank you for that. Thanks! I’m glad you found the letters useful. If you ever get the chance, I encourage you to check out the archives of famous writers. There’s a discrepancy between the books one finds on the shelf and the papers one finds in an archive — one discovers that the book is the product of years of trial and failure, self-doubt, and practice. I love it if only because it makes me feel as though I’m not alone.